So many good ideas get published on this blog in a year that it’s nearly impossible for one person to absorb them all. Examples from 2018 Content Marketer of the Year finalists were so inspiring they stayed with me. 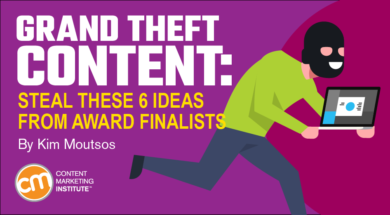 When it came time to offer up our latest batch of ideas to steal, I found it hard to pick just one from each. But I made myself do it. I looked for ones that can be applied in all kinds of organizations – B2B, B2C, big, small, and everything in between. Now I hope you steal at least one of these ideas – and then make it grand for your brand. When NASCAR’s content studio sold an eight-part docuseries to Facebook for Facebook Watch, the social media giant’s new video-on-demand platform was in its infancy. With its powerful story about the first African-American driver in the Daytona 500 since 1969, Behind the Wall: Bubba Wallace seemed like the kind of story audiences would rally around. But rather than just expecting people to find it on the Watch tab, NASCAR and Facebook marketed where they knew their audience would learn about it. They took to Facebook Live and Instagram Stories, tapped other drivers and celebrities to promote, plus the series’ charismatic star made plugs in his post-race interviews. The Behind the Wall With Bubba Wallace series had attracted more than 12 million views by the time we wrote about it in July. Sure, you may not have the budget to produce an eight-part docuseries. That’s not the point. Here’s the takeaway: Produce each content piece in part as an experiment – and give it all the promotional resources you can to help it succeed. B2B marketers may assume stories touching people’s hearts abound for their B2C counterparts but are scarce in their industry. Sorry, B2B marketers, you’re not off the hook. You can find great, moving stories in any industry. Glenn LaFollette, who leads brand strategy and editorial at JLL, helps his team find the magic in commercial real estate services, telling moving, impactful stories through text and videos on JLL’s Ambitions website. His secret? Focus not on the stories about the buildings but on the people who work and learn inside the buildings. JLL’s Ambitions publication tells the story, for example, of the Detroit Institute of Music Education (DIME), where JLL helped turn an abandoned building into an inspiring and acoustically appropriate space for a music school. The passion and commitment of the group’s founders and the JLL team supporting them came across on the page and came to life in an accompanying video. Similarly, a story (and video) about the company’s first patent starts not with a description of the patent but with the JLL engineer behind it, as a little boy tinkering with parts on the floor of his dad’s electrical contractor shop. Meaningful, human stories are out there. Glenn’s work reminds us that our job is to find them in the B2B community. Few content teams can function without a content calendar – especially in an enterprise environment. But planning months in advance can make it harder to pivot when new developments or of-the-moment opportunities come up. Create an editorial calendar based on topics relevant to what people are searching for according to input from the SEO team. Mobilize to help during rapid-response situations. Respond to seasonal needs. For example, both tax time and holiday shopping bring increased digital security threats. By building in the ability to respond to the unexpected, Randi and the team could spring into action when news broke, for example, about the Equifax data breach. The team quickly created banner ads and social posts that clicked through to information about the breach and a soft product sell. The takeaway? Plan, but don’t be a slave to your content calendar. Build in a little flexibility so you can respond to audience’s needs at the right moment. When you build success in one format, use the momentum to try out others. Each of the examples we shared of Jason Miller’s work at LinkedIn is impressive. What stayed with me, though, is how Jason grew The Sophisticated Marketer content brand from its humble origins as an e-book into an impressive set of media. If you build it and they come, you’ve done well. If they come and you keep leading them to more, you might just end up as a finalist on someone’s Content Marketer of the Year list. Read through the stories of content marketing award finalists from any year and you’ll find they always mention their team. There’s a reason for that: Content marketing is a team sport. And when you’re leading social strategy for a company with multiple brands (each with its own personality and distinct audiences) as Beverly Jackson does for MGM International, you really can’t go it alone. That’s why Beverly makes sure to hire a mix of content creators, strategists, and community managers. Then she puts them in charge of finding the narratives in the work they do. Most of her team can shoot and edit video, for example. They can capture interactions with the athletes and stars that come through the company’s properties and events on the fly. We content types love to sit down at our keyboards or pick up our video cameras and create compelling, persuasive things. Sometimes, though, there’s just no substitute for a live experience. That turned out to be the case when Xerox wanted to convince press, analysts, and tech influencers that the 100-year-old company has something interesting to say about the future of work. Led by Bertrand Cerisier, the Xerox team developed a series of in-person events and on-site experiences to prove that Xerox understands the modern world of work. Part of that meant letting reporters and other influencers see the products in action and hear the Xerox team’s vision in person. The resulting 518 pieces of coverage around the globe (400 million impressions) meant the effort paid off. The takeaway? The adage, “Show, don’t tell,” applies to more than writing. Where do you look for ideas to steal? You might notice that I didn’t offer any ideas to steal from 2018 Content Marketer of the Year winner Venetta Linas Paris, though she certainly has plenty to choose from. Don’t worry, you’ll hear more about them later in 2019. When you’re looking for inspiration, where do you turn? Do you look to others in your industry? Award winners? Or something else entirely? Let me know in the comments. Many thanks to Carla Johnson, who scoured the world to help us find these outstanding content marketers and wrote the articles the ideas came from. Be one of the first to learn when entries open for the 2019 Content Marketing Awards. Sign up for CMI’s free weekday newsletter.